50x50mm tanalised floor joists, fully rebated double doors & frame, fully glazed double doors & opening windows, mortice lock with handle & key, toughened glass to all low glazed sections,,diagonal bracing and heavy-duty felt high and low roof options available. 10’x6’ shown above with optional georgian windows, cedar cladding and cedar timber roof. (High roof option). 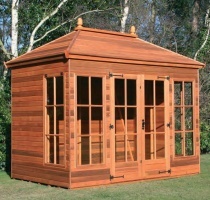 This classical summerhouse is well suited for lazy days by the pool or relaxing in the tranquility of the garden.